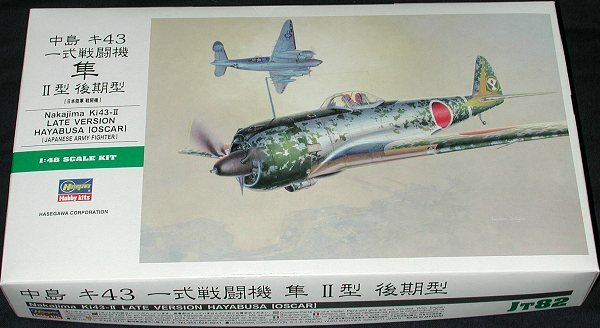 Hasegawa 1/48 Ki-43-II "Late Version"
Initially the Army did not like the Ki-43 as it was not as maneuverable as the lighter and smaller fixed undercarriage Ki-27. However, it did have much superior range and the war in China required a longer ranged fighter. Despite not being considered maneuverable enough, Allied pilots who attempted to dogfight with the Ki-43 soon found themselves in trouble. Fortunately, the lack of heavy armament of the Oscar often saved the foolish Allied pilots. Despite the known shortcomings of the Ki-43, the type was continually modified and produced even after the type was obsolescent. Many were expended in suicide attacks near the end of the war. To my knowledge, only one example still remains. If you have read the review or preview of the earlier Ki-43-I, then this kit will be no surprise to you. You will know that the detailing and fit of the kit is generally excellent. So what I'll do with this preview is to concentrate on what is different between the types. The -I version had a different cowling and a two bladed prop. There was also an oil cooler in the cowling opening. In addition, the -I had longer wings and larger horizontal stabilizers. The exhaust was also different between the two types. 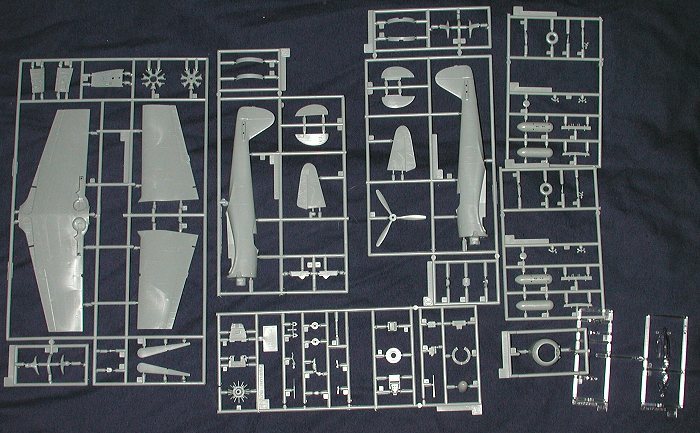 All of this has been taken care of with two different sprues, specifically the two center ones in the image above with the fuselage halves on them. While cursory examination showed no difference in the fuselage, I can't see any sense in duplicating the fuselage and I'm sure there are panel differences between the two variants. Like the previous kit, this one uses little plastic hold downs for the prop and tail wheel. The cockpit is the same and very well detailed. Also the same is the deployed 'combat flaps' which were designed to improve maneuverability by increasing the wing area when deployed. I do wish that Hasegawa had left them molded in the bottom of the wing as I have yet to find a photo of a plane on the ground with these deployed. Unfortunately, it is nigh impossible to glue them closed as they are far too thick to fit into the available positions in the lower wing. Instructions are equally as superb as before. There are two markings options. Both aircraft are from the 54th Sentai; one from the 2nd and one from the 3rd Chutai. The only major difference is in the color of the tail markings. Both are in natural metal with with rather heavy mottling. The mottling is rather heavily worn along areas that get a lot of wear from the pilot, maintenance personnel and from the effects of wind friction such as the leading edge of flight surfaces and the cowling. The box art version has the yellow IFF wing markings and the other does not. These wing markings are provided on the decal sheet, but from my lack of success with these decals on previous kits, I'd recommend painting them on! First I should mention that this is NOT the Fine Molds kit, but a totally new tool kit. It is superbly detailed, spot on in accuracy and a real delight to build. Those that build only 'shake and bake' kits will love this one. 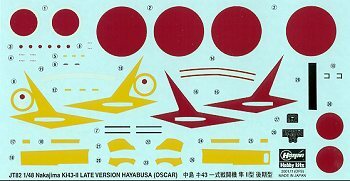 Those of us who don't mind doing work on a kit will enjoy the break that a modern Hasegawa provides. Highly recommended. Review kit courtesy of Marco Polo Imports. Thank you for your support.